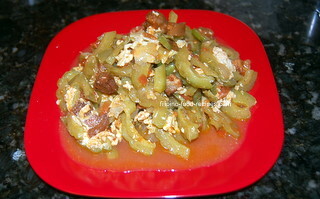 Ampalaya Guisado is a simple vegetable dish made by sauteing bitter gourd in garlic, onion and tomatoes and finished off by topping with beaten egg. 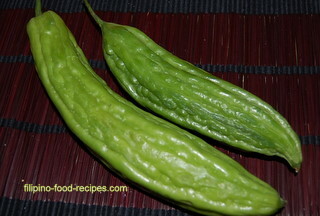 Ampalaya or Bitter gourd is a tropical vegetable that has a strong bitter taste. The health benefits, though, should compensate for the taste. It is known to lower sugar levels and thus, good for diabetics. Also effective in treating hypertension, constipation, and the juice is said to be a good blood purifier. You can lessen or mellow out the bitterness of the ampalaya by sprinkling some salt and setting aside to sweat, then wringing out the juice. Though if you want the full nutrition that you could possibly get from this vegetable dish, leave out the juice. 1 Saute the garlic, onion and tomatoes. Add the pork and saute for a minute. 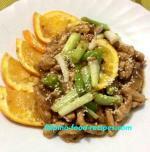 2 Add the ampalaya and the fish sauce. 3 Pour in the broth and cover to let it boil, then turn the heat down to simmer for 5-10 minutes until the vegetables are cooked but still firm. 5 Pour the beaten eggs on top and do not stir. Let it cook for a minute before turning the heat off. If you had salted the ampalaya to sweat out the bitter juice, you can rinse out the salt if you want. Otherwise, adjust the fish sauce that you will put in so the dish will not be too salty. Do not stir the eggs once you add it in so it doesn't break down and look unappetizing. If you have fried fish or pork leftovers from the day before, you can use them here as long as they're not seasoned with overpowering flavors.